As illustrated on the graphic timeline above, Act Six scholars are chosen through a rigorous, highly competitive, three-phase selection process that spans four months. Applicants complete an initial online application that includes a basic college admissions application as well as additional essay questions, letters of recommendation, and family financial information. All application materials must be submitted by 11:59 pm on November 6, 2018 . After an initial screening of written application materials, top applicants are notified by email on November 27 and invited to participate as candidates in Phase II. Candidates participate in a local half-day interactive event on December 8 where they demonstrate their academic and leadership potential while working together to address a complex community issue. Candidates learn more about each partner college and can update the list of colleges for which they wish to be considered. A local community committee considers candidates’ performance on both the written and interactive components to name 20-30 semifinalists for each partner college. Decisions are emailed on January 9. Semifinalists travel to the college for which they were selected for a two- or three-day event between January 25 to February 14. Phase III allows students to experience campus life as they participate in a four-part evaluation process that includes a personal interview, an on-site writing task, academic seminar discussions, and group problem-solving activities. A parent or guardian is invited to participate in a portion of the visit. Each partner college selects finalists and mails decision letters on February 20. Finalists are given one week to decide and commit to the Act Six program, agreeing to attend the college for which they were selected and to participate fully in the five-month training program. Applicants may withdraw from the process at any time prior to this commitment. The new class of Act Six scholars are formally announced to the public on March 8. Applicants must be high school seniors planning to graduate in 2019 or must have previously graduated from high school in 2018 or 2017. Students enrolled at two-year colleges in the region may apply, but students currently enrolled at four-year colleges, including partner colleges, are not eligible to apply. While ethnicity and family income are considered as factors in selecting an intentionally diverse group of scholars, there are no income restrictions, and students from all ethnic backgrounds are encouraged to apply. Selecting Act Six scholars is a complex and multi-faceted process that considers many factors. The selection committees use the following questions to guide their evaluation of Act Six applicants. These questions best summarize what we are looking for in Act Six scholars. To what extent will the student contribute to the ethnic, economic, and experiential diversity of an Act Six cadre? To what extent is the student prepared to succeed and thrive academically at the selected college? To what extent will the selected college be a good fit for this student? To what extent will the student eagerly engage in a year-long exploration and discussion of Christian perspectives on leadership, diversity, and reconciliation? To what extent does the student understand and desire to advance the stated mission of the selected college? To what extent will the student be a service-minded leader and an agent of transformation on the college campus? To what extent will the student be committed to serving others and to what extent will s/he view the Act Six initiative as an opportunity to reach out to those around him/her? To what extent will the student be committed to and effective in fostering intercultural communication and acting as an agent for social change on the college campus? To what extent does the student see a sense of purpose in his/her participation in the Act Six Initiative? To what extent will attending the selected college and participating in the Initiative align with and/or transform the student’s goals and vision for his/her life? To what extent will the student be able and willing to persevere through hardship? How resilient is s/he to the challenges and struggles that life brings? To what extent does the student possess a depth and strength of character that will serve to encourage, support, and empower those around him/her? The Act Six Community Selection Committees represent diverse and talented teams of community leaders who work with young people from across our region and from a wide range of backgrounds as well as those working to increase college access in our state. The committees represent the kind of diverse cadre of talented leaders that they are working to select. Members of the selection committees are listed below. WHAT DOES IT MEAN TO BE AN ACT SIX SCHOLAR? It’s easy to start your online application, and important that you begin the process early to make sure your application is completed by the deadline. There is no application fee, and your completed Act Six application also serves as an application for regular admission at the colleges you select, even if you are not chosen as an Act Six scholar. You can check your eligibility and start your application now and then stop and return to the application whenever you wish. Do you love your community and want to use your college education to make a difference as a leader on campus and at home? Will you graduate from high school in 2019, or did you graduate previously in 2018 or 2017? Do you live in the Portland area and, if selected, could you arrange your own transportation to weekly evening trainings in Northeast Portland? Do you want to attend George Fox or Warner Pacific? This year’s selection window has closed but you can check back next year to see if you are eligible. To complete your application, you will need to submit all of the following components by 11:59 pm on November 6, 2018. The first step of the application process is the Main Application form, where you provide detailed demographical, educational and extracurricular information, and indicate to which college(s) you wish to apply. Begin by creating a username and password to start your application. Be sure to complete at least the Getting Started form in your first session. All of your responses are saved once you submit each page, and you can return at a later point to keep working on the application. The personal essays are perhaps the most important part of your Act Six application. Therefore you should allow time to carefully consider, thoughtfully compose and thoroughly edit each essay. You will be evaluated on content, mechanics and style. It is critical that you compose your essays in a separate word processor so you can use spell check and edit carefully. When you have a final product, copy and paste your essays into the online form. Use plain text only, as no formatting or special characters will be preserved. Insert a blank line between each paragraph. Responses to each question must be no longer than 500 words. This is typically about one page, double-spaced. Use the word count feature of your word processor to check the length, then confirm that the complete essay is pasted into the form. Please be aware that if you disclose information regarding child abuse, neglect or other harm to minors, readers may be required to report this information to the appropriate authorities. Act Six seeks to identify service-minded leaders who want to make their college campuses and their home communities better. This question has two parts: First, describe something that you appreciate and something you would like to change about your current community. Second, how will your college education equip you to bring about the transformation you hope for your community? Describe a concrete way that your ethnic or cultural background has shaped your life. 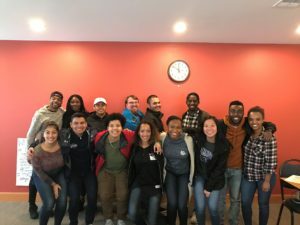 Reflecting on that background, what unique perspectives and strengths would you bring to the college campus and how would you hope to grow personally as a part of a multicultural Act Six cadre? Describe any personal hardships, unusual circumstances you have had to overcome, or other aspects of your life story that you think we should consider in reviewing your application. How have these experiences shaped you as a person and how can they help you in the future? George Fox University, Warner Pacific University, and Portland Leadership Foundation do not expect or require any faith commitment from Act Six applicants. We are, however, committed to providing top tier instruction in the context of Christ-centered faith. What role has faith played in your life up to this point, how do you see it influencing your decision about college and career, and how do you feel about studying at a Christian institution? You and your parent(s) must complete the FAFSA at fafsa.ed.gov, starting October 1, to estimate your EFC (Expected Family Contribution) and then submit four important numbers on the online Act Six Financial Summary form. Because of the nature of the Act Six scholarship commitment and the desire of the program to select an economically diverse cadre, it is important that we have accurate information regarding each applicant’s financial situation. Neither high nor low income levels will make applicants ineligible. However, in order to provide an accurate estimate of the actual Act Six award at the time of selection, it is critical that Act Six, partner colleges and each applicant’s family have an accurate estimate of the applicant’s Expected Family Contribution (EFC). In order to complete the FAFSA, both you and a parent you live with need to create a FSA ID, which will allow you both to access and sign your FAFSA. Visit fsaid.ed.gov/npas to create a FSA ID. Start your FAFSA at fafsa.ed.gov. Visit the FAFSA Help Page for an overview of the process and answers to many common questions. If you have further questions, ask a counselor at your school for assistance. Please ensure that you indicated on your FAFSA to have results sent to every college that you selected on your Act Six Main Application. Once you and your parent complete and sign the FAFSA with your FSA IDs, you will receive a FAFSA Student Aid Report that summarizes the information you provided and shows your Expected Family Contribution (EFC). With your FAFSA Student Aid Report in hand, complete this Act Six Financial Summary form. You cannot complete this form without your Student Aid Report. This form, along with all of the other required parts of the Act Six application, must be completed by November 6. You must request that an official high school transcript and copies of SAT or ACT score reports be sent to Act Six by your high school registrar or counselor. If you have taken college classes, you should also request an official transcript from your college. You provide a name and email address for the registrar or counselor who you want to submit the documents, and an email invitation will be sent to that person, who can then either mail the documents or upload them online. Scores from the SAT or ACT are required for admission to both partner colleges. Scores you have already received should be reported by your school in the High School Counselor Report form of your online application. If you are applying to either of these schools and your school has not received results by the application deadline, you may still apply for Act Six, but a copy of the exam score report must be received by the Act Six office no later than December 31. Applicant’s cumulative grade point average. Applicant’s class rank (If precise rank is not available, please indicate rank to the nearest tenth from the top). Percentage of the class planning to attend a four-year college. In comparison to other college preparatory students at your school, the applicant’s course selection is (very demanding, demanding, average, less than demanding). Please list all courses in which the applicant is currently enrolled. Applicant’s anticipated or actual graduation date. Has the applicant ever been found responsible for a disciplinary violation at your school from ninth grade forward, whether related to academic or behavioral misconduct, that resulted in probation, suspension, removal or expulsion from your institution? If so, please give the approximate date of any incident and explain the circumstances. To your knowledge, has the applicant ever been convicted of a misdemeanor, felony, or other crime, or have a court case pending against him or her at this time? If so, please give the approximate date of any incident and explain the circumstances. Note that you are not required to answer “yes” to this question, or provide an explanation, if the criminal adjudication or conviction has been expunged, sealed, annulled, pardoned, destroyed, erased, impounded, or otherwise ordered to be kept confidential by a court. Compared to other college-bound students you have worked with, how do you rate the applicant (below average, average, above average, very good, extraordinary) in terms of: leadership, academic achievement, intellectual promise, quality of writing, creative, original thought, productive class discussion, respect accorded by faculty, disciplined work habits, maturity, motivation, integrity, reaction to setbacks, concern for others, self-confidence, initiative, independence, and overall. How long have you known the applicant and in what context? List the academic courses that you have taught the applicant, noting for each the grade level (9th, 10th, 11th, 12th) and the level of course difficulty (AP, honors, IB, elective, etc.). Do you think the applicant is ready to succeed at college? Please provide an assessment of the applicant’s academic preparation for college. Please explain any areas of concern. Why do you believe the applicant is a good candidate for the Act Six initiative? Highlight what you think is most compelling about the applicant. Describe a specific situation when the applicant stood out or impressed you. What was the challenge encountered and how did the applicant respond? Please rate the applicant (below average, average, above average, very good, extraordinary) in each of the following five categories. Use the “extraordinary” rating only for truly exceptional performance. For example, an applicant who is the best you have seen in five years may rate as exceptional. Then, explain your rating by giving a specific example of the applicant’s behavior. Does the applicant demonstrate a level of insight and perception indicative of a leader? Does the applicant have a realistic awareness of the challenges of leadership? In light of these challenges does s/he posses a willingness to step out of his/her comfort zone to be a leader? Does the applicant see Act Six as an opportunity to be a part of something significant and important? Does s/he demonstrate a desire to make a real difference on the college campus and their community at home, to educate as well as learn from others? Is there evidence that the applicant’s leadership and community involvement is motivated by a sincere desire to invest in the welfare of people, rather than to merely build a resume? Does the applicant’s understanding of the benefits of leadership emphasize the rewards of empowering others more than the recognition and notoriety that comes with leadership? Does the applicant clearly articulate a long-term commitment to serving others? Can the applicant articulate ways that s/he hopes to change and grow through college? Does the student’s discussion of his/her goals and desired personal growth complement the mission of the Act Six initiative? Does the applicant have a strong sense of their own identity? Does the applicant articulate the value of people from different backgrounds being together and building authentic relationships across their differences? Does s/he do so with perspectives and insights that penetrate beyond surface-level cliches and easy answers? Does the applicant have significant experience in multicultural settings and has s/he reflected on that experience in ways that suggest that s/he can carry it forward to the campus community? Does the applicant acknowledge that there are very real challenges in bringing people from diverse backgrounds together? Does the applicant possess a depth and strength of character that will serve to encourage, support, and empower those around him/her? Has the applicant demonstrated the ability to overcome adversity? Does the applicant possess motivation, creativity, relative maturity, integrity, independence, originality, passion for learning and capacity for growth? After five months of training with their cadre, Act Six scholars begin college ready to engage the campus and community with a built-in support system and a sense of purpose as service-minded leaders and agents of transformation. Act Six sends scholars together to college with the built-in support and encouragement of a cadre of fellow leaders who share a common mission. Act Six is the only urban leadership award that offers unparalleled full-tuition, full-need scholarships. Since 2002, 814 Act Six scholars have received nearly $43 million in grants and scholarships, with another $35 million pledged over the next four years. Act Six offers Portland’s only full-tuition, full-need community leadership scholarship. Act Six works with colleges and other partners to guarantee that full scholarship recipients receive grants that, at minimum, cover full tuition at the college for four years. Scholars with need beyond tuition (as determined by the FAFSA) will receive additional grant and work study to fully meet that need. For most scholars, the awards will therefore cover some or all of the cost of room and board, books, travel and personal expenses. To retain the scholarship, scholars are required to remain active in the program and maintain satisfactory academic progress throughout their undergraduate studies. Each year students and their parents must complete the Free Application for Federal Student Aid (FAFSA) which will determine the family’s Expected Family Contribution (EFC). Students who are unable to complete the FAFSA will complete an alternative form to determine their EFC. The family’s need is then determined by subtracting their EFC from the total cost of attendance (including tuition, room and board, books, travel and personal expenses). Act Six award packages begin with any government student aid or outside scholarships for which students qualify. After outside grants and scholarships have been applied, the college commits to providing scholarship aid that will meet full tuition for every Act Six scholar. If the family’s need exceeds the cost of tuition, the college commits to providing additional scholarship aid and work study to meet full need. Each family will be responsible for covering their EFC. Because financial aid policies prevent colleges from exceeding need except in rare situations and because Act Six awards meet full need without loan, scholars can be assured that they are receiving unsurpassed award packages. Getting to college is just the start of the Act Six experience. Bound together by a shared mission and commitments, scholars learn to encourage and challenge each other while they receive ongoing support from their colleges and Portland Leadership Foundation. After five years together, alumni graduate from college connected to each other and ready to lead in the community. Together, they are weaving a fabric of leadership that will shape the future of our cities. On campus, faculty and staff mentors meet regularly with the cadres and with each individual scholar as needed. Mentors provide social support and connect students with campus resources. This support helps scholars thrive academically, but also empowers them to get involved and step out into leadership roles on campus and in the surrounding community. Back home, Act Six staff and coaches provide additional support, ongoing leadership development and assistance connecting with internships and career opportunities. Every two years, Act Six hosts a regional convention that convenes scholars and alumni from across the Northwest for three days of challenging speakers, workshops and networking, along with a career and graduate school fair. National data show that less than a third of all students from low-income families who start college ever graduate. The data are equally discouraging for students whose parents didn’t attend college and those from most underrepresented ethnic groups. But the statistics for Act Six scholars tell a much different story: Since 2002, Act Six has selected and trained 814 scholars from seven cities in 121 cadres for 16 partner colleges. They represent six continents of the world, speak 70 native languages, and represent the very best emerging urban and community leaders that these communities have to offer. While 90% of scholars come from low-income households or are the first in their family to go to college, they are defying the odds with graduation rates of 85%. When you think about moments of significant positive change that have happened in your community, you can usually point to a group of connected people who made it happen. Networks of effective leaders working together get things done. The problem is that those leadership networks don’t always look like or represent the full breadth of a community, and as a result, some groups tend to get left behind. For our communities to thrive in the future, we need diverse networks of homegrown leaders who love their home and are committed to building vibrant communities where everyone thrives. It is precisely this kind of diverse, committed leadership network that Act Six is producing. In our second decade of Act Six, with 335 alumni, we are beginning to see the fruits of this fabric of leadership as alumni grow in their responsibility and deepen their connections in the community. Where did the name "Act Six" come from? In the sixth act (or chapter) of Luke’s drama about the early followers of Christ (the New Testament’s Book of Acts), we find a church that was confronted with the reality of ethnic inequality in the distribution of a critical resource. How the early church responded to inequality in food distribution can inform how we respond to the clear and disturbing inequality in the distribution of one of today’s most critical resources: education. At the heart of the solution was the selection of a cadre of leaders from the affected minority group that was charged and empowered to work toward a solution. Provided with every resource they needed, this group created a solution that made way for dynamic growth in the church, and in the process produced two of the early church’s most significant leaders. Get the full story in Acts 6:1-7. Do I have to be a Christian to apply? No. Act Six was born out of the conviction that division and inequity among people saddens God and that the leadership needed to bridge and heal those divisions requires a deep humility and commitment to service. Act Six believes that the Christian faith both demands and makes uniquely possible a bold and authentic reconciliation between people from across God’s creation. Act Six staff operate out of deep Christian commitments–commitments that include genuine respect for those who do not share their convictions. Act Six applicants are not required to make a statement of faith or consent to any doctrinal statements. They must, however, be open to exploring Christian perspectives on leadership and service and should be aware that a significant portion of the training program will be dedicated to this exploration. In the midst of this exploration, disagreement and differing perspectives are welcomed and engaged. Applicants should also be comfortable with the distinct identity, mission and faith commitments of each college to which they apply. You can explore the broad diversity of how each college understands its commitment to faith and learning on each college’s website. Do I have to be a U.S. Citizen to apply? No. U.S. Citizens, Dual-Citizens, and Permanent Residents are eligible to apply for Act Six at both partner colleges. Undocumented immigrants may apply for Act Six at George Fox. DACA recipients are eligible to apply at both partner colleges. Is Act Six only for students of color? Only for low-income students? No. The goal of the program is to select an intentionally diverse group of students, both ethnically and economically. While the majority of students selected will likely be students of color, low income, or the first in their families to go to college, White students and students from middle-class families who have experience relating to people from diverse backgrounds are encouraged to apply. Selecting students from a range of backgrounds is critical to creating a cadre that will serve as a model of healthy and honest intercultural relationship that is at the heart of racial and economic justice and reconciliation. How are scholars matched with colleges? You are encouraged to learn as much as possible about each partner college as you decide where you wish to apply. In your application, you will be asked to indicate for which college(s) you wish to be considered for Act Six and general admission. If you select more than one college, you will be asked to indicate your preferences by ranking your selections. If you are not selected to advance as a candidate to the Phase II event, your application will be sent on to the college(s) you indicate below to be considered through the regular admissions process. If you are selected to participate in Phase II, you will learn more about each college and have the opportunity to update your preference at the event’s conclusion. After Phase II, local selection committees will select 20-30 semifinalists for each college. As in the previous phase, if you are not selected as a semifinalist, your application will be sent on to the college(s) you listed after Phase II for consideration through the regular admissions process. Those selected as semifinalists for each college will be admitted to that college and will be invited to participate in the on-campus Phase III event at that college. After Phase III, each college will name finalists. Finalists will have several days to decide and commit to the Act Six program, agreeing to participate fully in the six month training program. Those not selected as finalists and those finalists who decline the Act Six offer will still be granted admission to that college and will be considered for regular admission to the other colleges that they indicated on their application. If admitted, they will receive financial aid awards through the regular financial aid process. Why do I need to provide my family’s financial information? Because of the nature of the Act Six scholarship commitment and the desire of the program to select an economically diverse cadre, it is important that we have an accurate estimate of applicants’ financial situation. Further, in order to provide a good estimate of the actual Act Six award at the time of selection, it is critical that the program have an accurate estimate of the student’s Expected Family Contribution. The information provided in the Act Six application process is the same information that colleges will later receive through the FAFSA and gives both Act Six and families an early and reliable estimate of their EFC. All financial information is treated confidentially. Are there any income requirements? No. While family income will be considered in choosing an intentionally diverse group of students, neither high nor low income levels will make applicants ineligible. Do I make any commitment to colleges just by applying? No. Applicants make no commitment to the program by submitting a Phase I application or by participating in Phase II or Phase III of the selection process. They may at any time remove themselves from consideration. Students who are selected as finalists will be given several days to accept the the award. If they decide to participate in the program, students are then required to participate fully in the six month training and preparation program throughout the remainder of the year in order to receive the scholarship. Why is the application deadline so early in the year? The primary reason for the early application deadline and selection dates is to allow for the six month training and preparation program throughout the rest of the year before the cadre heads off to campus. While the early deadline certainly adds some urgency to the beginning of the year, it also dramatically frees students who are selected from the stress that accompanies the rest of most students’ senior year. By February, scholars who are selected will know where they are going to college and will know that they have the best financial aid possible. Gone is the stress of applications, decisions, and financial worries that typically clouds the spring of senior year. Instead, you’ll be able to focus on preparing to be successful in college and on developing the skills to engage the campus when you arrive. Another challenge with the timeline is the need for students who are selected to commit to a college before they have heard from all of their other college choices. While this early decision likely will come with a bit of uncertainty, what is certain is that Act Six scholars will be heading to a great liberal arts college with an unbeatable financial aid award, incredible preparation and an unparalleled support system. What if I won’t have an SAT or ACT score back before the application deadline? Scores from the SAT Reasoning or ACT are required for admission to both partner colleges. Scores you have already received should be reported by your school in the High School Counselor Report form of your online application. If you are applying to either of these schools and your school has not received results by the application deadline, you may still apply for Act Six, but a copy of the exam score report must be received by the Act Six office no later than December 31. No. However, Act Six is looking for talented students with strong scholastic potential who are passionate about learning and who will succeed and thrive in challenging academic environments. You can compare the academic profiles of each of the Act Six partner colleges to get a sense of the range of typical students at each school. Students with weaker high school grades must find ways to clearly demonstrate this passion for learning and potential for success. Act Six is Portland's only full-tuition, full-need scholarship for emerging community leaders who want to use their college education to make a difference on campus and in their communities at home.